It's 06:29 in San Jose, USA right now. View of the Skyline A view of the skyline of San Jose, California, from the SJSU Meteorology Department. San Jose, California: Lick Observatory, 0 miles away. San Jose, California: Milpitas Christian School, 0 miles away. Cupertino, California: Cupertino Civic Center Plaza, 8.5 miles away. Cupertino, California: De Anza College, 8.5 miles away. Saratoga, California: Saratoga Weathercam, 8.9 miles away. 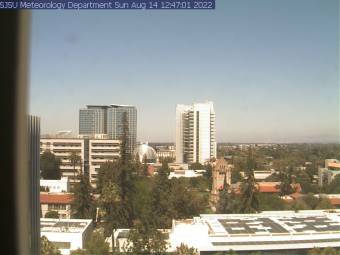 Sunnyvale, California: Webcam Sunnyvale, 9.3 miles away. Sunnyvale, California: Megapixel Webcam Sunnyvale, 9.3 miles away. Mountain View, California: WeatherCam Mountain View: Gemello Skies, 12.2 miles away.